The paisley fabric with the navy background was my beginning point for this quilt. I added an assortment of reds, oranges, rusts, and caramels. Definitely not my normal color choices, but fun to try for a change. I find red hard to use in quilts without it dominating the whole thing, so for this one, I just let it be in charge! As for the design, I always love circles. I also have not done raw edge appliqué for a long time so I decided to revisit it. While it may not be everyone’s style, I do like the texture it adds, and it’s a quick easy way to add curves to your design. I backed this one with a lovely blue floral voile that I’ve been hoarding. It’s a piece that I bought a year ago when we were in London and I visited Shaukat Fabrics (they have tons of Liberty fabrics but also many others that are a similar style). This is one of those pieces that I’d buy a whole bolt of if I could, simply because I know I would use it. 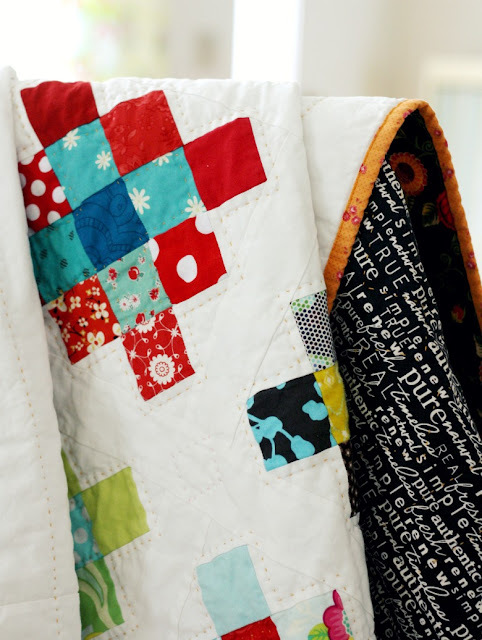 It’s a print and color that goes well with so many different quilt tops, and the weight is lovely as well. Another new thing I tried was a single fold binding rather than a double fold (I don’t think I’m ever going back, but I’ll talk about that another day!). Also I used a decorative stitch to sew the binding down. It takes a lot longer, but worth it to add something a little special. Ein wunderschöner Quilt in warmen, erdfarbenen Farben. Einfach zum einkuscheln. Yes red can dominate. My guild had a challenge. Just use a touch of red in a small quilt. Even very small pieces of red would always catch your eye first!